The UNT Division of Student Affairs’ Students of Need: Suit Up, Fuel Up, Cap Up proposal, which will promote student success and career readiness by supporting three essential, need-based programs, was selected by the UNT Diamond Eagles Giving Society as their next fully funded project. This year’s investment, which was unveiled on January 30, will enable the DSA to create a centralized location in Crumley Hall for three existing student service initiatives: Suit Up, the UNT Food Pantry and Mean Green Gowns for Grads. Centralizing the programs will simplify staffing, minimize labor costs and allow students to have their needs met with privacy and discretion. The programs impacted by this project all aim to solve problems that stand in the way of a student’s well-being and achievement: Suit Up, a Career Center program, helps students prepare for internship and interview opportunities by allowing them to pick out free, professional clothing; the UNT Food Pantry, under the Dean of Students Office, works to ensure that no student’s success is compromised by food insecurity; and Mean Green Gowns for Grads, also under the Dean of Students Office, strives to alleviate the hardship of graduation expenses for low-income and first-generation college students by offering free cap and gown rentals and providing graduation photo sessions. The three programs are currently housed in separate buildings with inadequate space, but the new location will allow for the expansion of vital offerings and services. 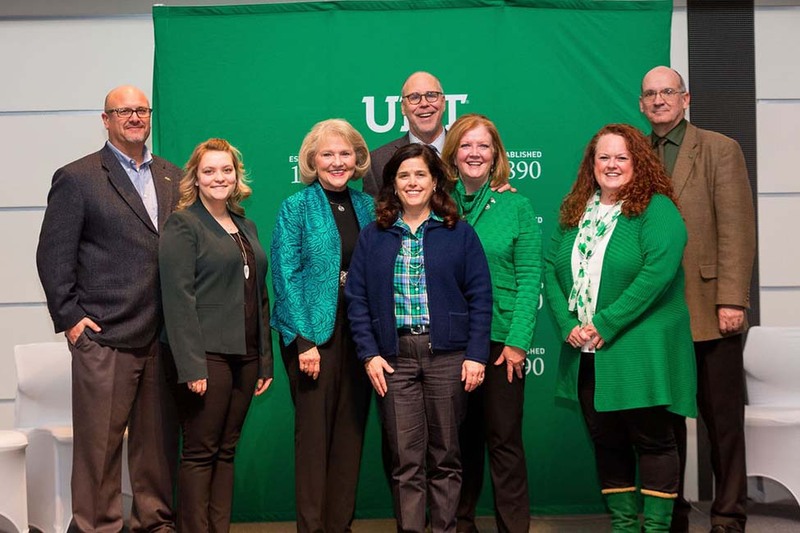 Notably, the project will provide Suit Up with dedicated fitting rooms and the ability to loan professional clothing year-round; allow the UNT Food Pantry to offer refrigerated and frozen foods for the first time; and give Mean Green Gowns for Grads the space to store more graduation regalia and extend the program’s reach. Planning for the new space is currently underway, with the goal of implementation in the fall. The funding—an estimated $90,000—was generated through the Diamond Eagles’ unique venture philanthropy model. Every year, members make $1,000 individual contributions and then pool their gifts together to fund a high-impact campus project, determined by a member majority vote.